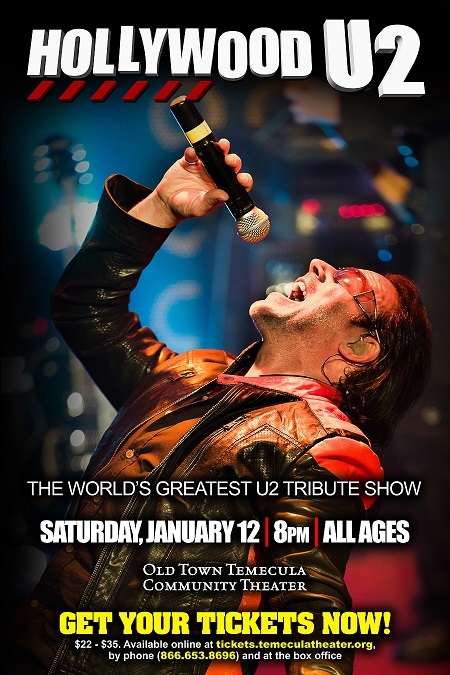 Award-winning U2 tribute band Hollywood U2 brings a musical homage of epic proportions to Old Town Temecula CommunityTheater. Lead singer Joe Hier was invited by Bono on stage to perform live with U2 on their i.e. Tour. Now you can catch the tribute artist who Bono called "the split of me." Arguably the world's greatest U2 tribute act, Hollywood U2 has toured extensively throughout the country and overseas, bringing the music of Bono, The Edge and company to delighted audiences around the globe. Hollywood U2 is not simply a group of impersonators who bear an uncanny resemblance to the original group, they're also consummate musicians who bring the true heart of the Grammy-winning band to every performance. **Please call the Ticket Office regarding group orders.